Healthcare is something that everyone can relate to. It effects all of us, either personally or via our family, friends or others we are close to. For EGGS, designing for the healthcare industries is about bridging the gap between complexity and vulnerability, whether it be for public health services or private healthcare providers. This could involve anything from intricate systems and high-tech products, to users, patients, relatives or nurses, spanning all age groups. At the end of the day, it’s about placing the user at the centre and seeing things from their perspective. Creating systems and services that are organized around them, developing solutions that make life easier for relatives, in addition to products that provide people in need of care a better, more comfortable and dignified life. In order to devise the optimal experience for users and patients, three key elements need to be considered when working on projects within the health sector – whether it’s a service, or a digital or physical product. When we innovate and create new solutions, we seek inspiration from the people they directly effect. Therefore, we listen, talk to and observe patients and their families, as well as professionals. It’s important for us to get closer to individuals, and to fully understand all users so that we have a comprehensive knowledge of their requirements. As designers, we come in as a neutral third party and translate our insights into the most optimal, relevant ideas and solutions. Being designers, we are by no means the experts in the room. We leave that to the doctors, nurses, technicians, researchers and others more qualified in their respective fields. But in the process we see the value of working as one and co-creating the business or organization with them. Our role is to ask all manner of questions, to simplify and visualize everything throughout the entire process. As a result, everybody is always on the same page and shares a common goal throughout. We thoroughly believe in constantly prototyping and testing solutions along the way, eliminating any possible chances of the final solution not being of maximum relevance to users. Gaining important feedback from all involved throughout the entire design process helps us to further develop and work on ideas, whilst allowing for any necessary adjustments. 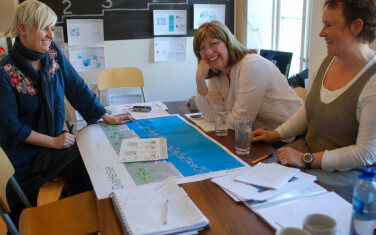 EGGS Design has built up extensive expertise and knowledge as a result of working on many projects within the health sector throughout Norway. We appreciate the complexity in this field and the need to create products and solutions based on empathy. By having a dedicated mind-set every step of the way, and with the users’ best interests always at the forefront of our minds, we totally believe in our ability to add maximum value to each project we undertake.